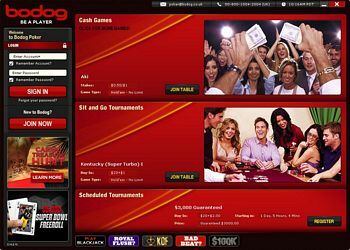 Mega-site Bodog offers online poker, casino, and sports betting, along with mobile friendly versions so you can play poker or blackjack or bet on football while on the go! To start, click on the "Download Now" button above which will immediately prompt you to save the Bodog setup file. Click on "Save File". Depending on your computer set up, you may get a prompt asking for permission to run the program or a Security Warning. 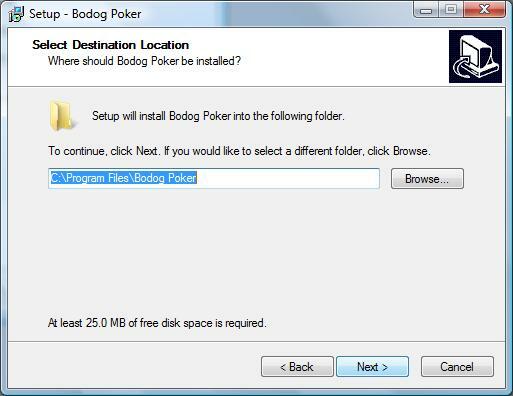 Go ahead and continue with the installation, the Bodog Poker Setup file is safe and virus-free. The Setup Wizard will launch, click "Next". You may change the installation directory here. 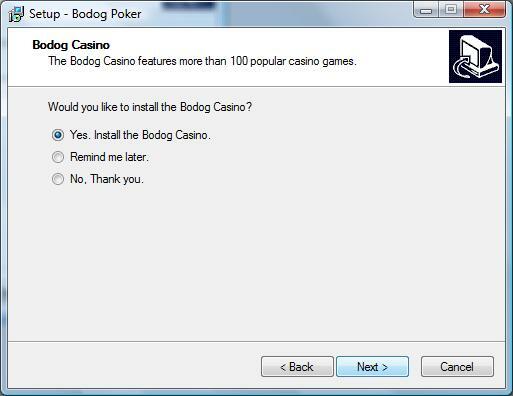 Also note the disk space required to install the Bodog software. Click "Next". 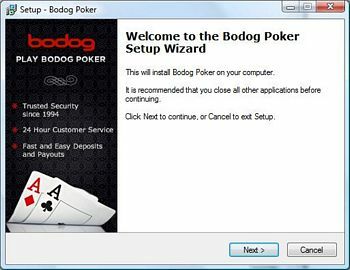 The setup wizard defaults to installing the Bodog Casino. We recommend installing the Bodog Casino! Click "Next". The Bodog Poker Setup will complete and then open up the Bodog Welcome screen as shown. 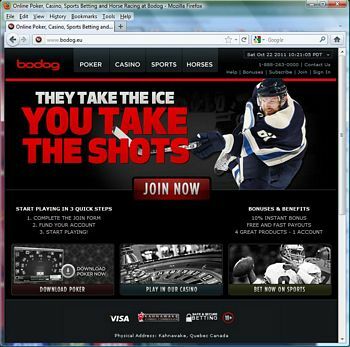 Click on the red "JOIN NOW" button located on the left hand side to create your new Bodog account. If you already have an account, you may login. This is the Bodog homepage, click on the red "JOIN NOW" button to create your Bodog account. Your account will be good for the poker room, casino, and sportsbook! Enter your REAL personal information. 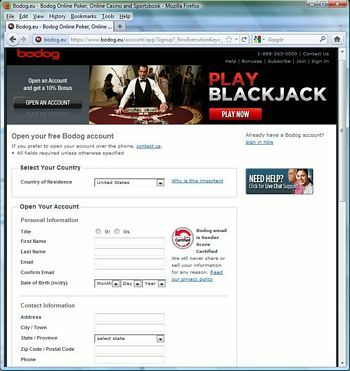 Bodog Poker is a safe and secure site, your personal information is protected and will never be shared with 3rd parties. Complete the rest of the form. Read the Terms of Service and check mark that you certify your information. Click "Open My Account". 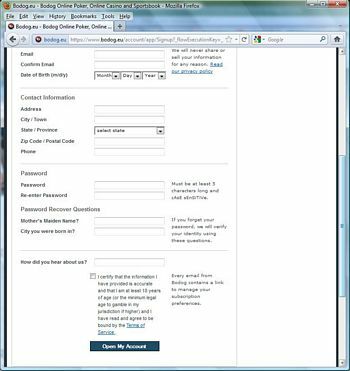 You will be given your account number at the top of the screen, keep a record of your account number. You will then be prompted to make your deposit. Bodog offers Visa, Rapid Transfer, or MyPaylinQ. 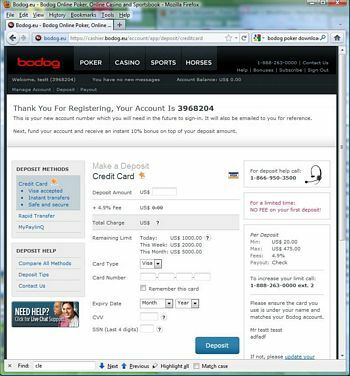 Return back to the Bodog Poker program, and log in using your new Account Number and password in the top left hand corner. 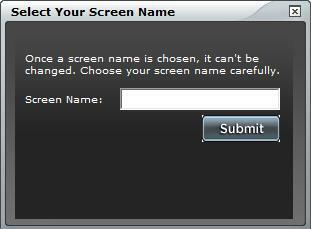 You will be prompted to create your Screen Name. This will be your poker handle that all other players will see. 11. Navigate the Bodog Lobby to Find the Game of Your Choice! You may click on the red bars that read "Cash Games", "Sit and Go Tournaments" and "Scheduled Tournaments" to expand or collapse those sections to view the available games within. Bodog is a gambling company originally founded in 1994 by Calvin Ayre. Although Bodog is best known for its sportsbook, Bodog has a great casino product and bustling poker room. Bodog.com, which now redirects to Bodog.eu, no longer offers services to US players, but their sister site Bovada does! The Bodog and Bovada poker rooms share the same player base so there is plenty of traffic, including fishy players that spill over from their respective sportsbooks. Have you ever played poker with sports bettors? The general consensus is that the Bodog poker room is loose and juicy, and a great place to play lower to mid stakes games and clean up! The Bodog Poker download is eye-catching and fast. The modern, innovative design is sleek and simplistic, using a spotlight to highlight the current action. Players can utilize the Bodog player cards system to keep notes on players. 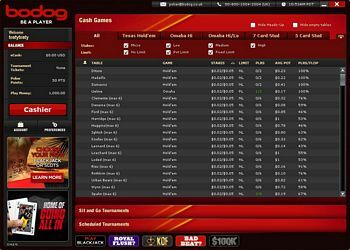 The Bodog software also provides Tournament information and your own player stats at your finger tips while at the tables. The poker tables themselves can be resized, customized, and multi-tabled up to four tables simultaneously. Bodog Poker offers a fantastic bonus of 110% up to $1,100. 10% of this bonus is immediately granted, and can be played with!! Click here to visit Bodog Poker. Don’t forget to also check out the Bodog Casino and visit the famous Bodog Sportsbook! Another alternative for a good poker site is Americas Cardroom. Redeem this Americas Cardroom promo code for a huge welcome bonus of $1,000.